Right chaps final proto flannels are here. I need a little feedback please. The waistband will be 3.5cm. The belts are 2.5cm. With the drop belt loops the width on the waistband is 4.5 to 5cm. My question is would you prefer the loops sewn into the waistband at the top and bottom? 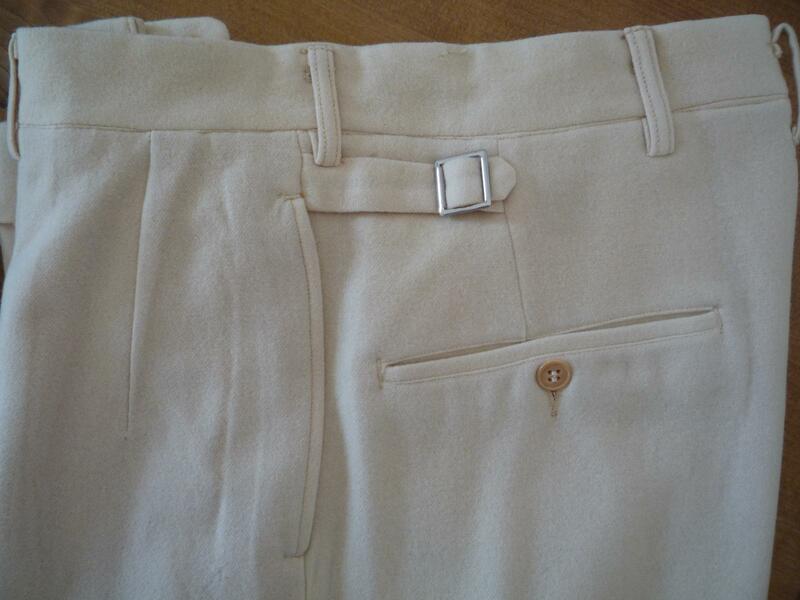 Or loops sewn just into the bottom of the waistband. Or as they are. My only issue with as they are is they make the waistband another 1/1.5cm wider for a wider belt and thus more gape more I dunno unnecessary space. Since the flannels are not workwear I would make the loops narrower. Personally I think this a very aesthetic way of doing belt loops. 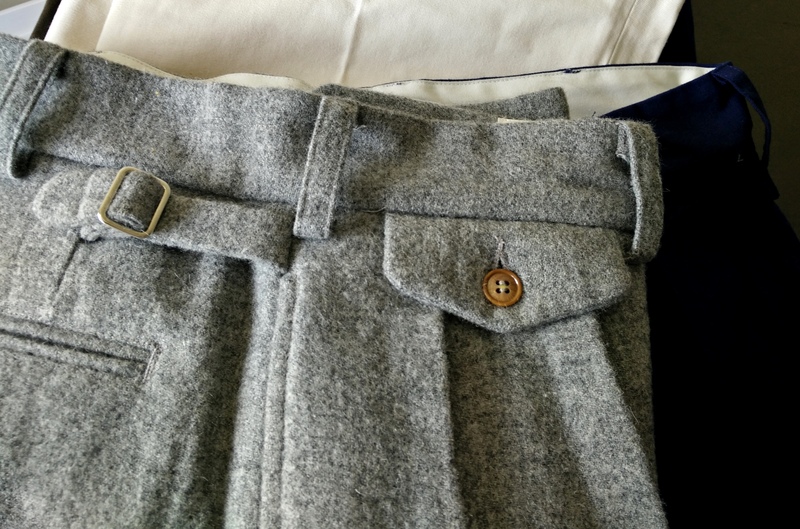 Of course sewn into the waistband was quite common on 30s (not 40s) U.S. trousers, too. However it's also quite common on repros and standard on modern trousers. So I think this 30s type of dropped loop (upper end not dropped, lower end dropped) is a nice way to set them apart without compromising functionality when using narrow belts. And you have the option of wearing a 1 1/2" braided belt or something (4cm is probably the effective limit for those loops). Besides they are already live on the shop in that configuration. 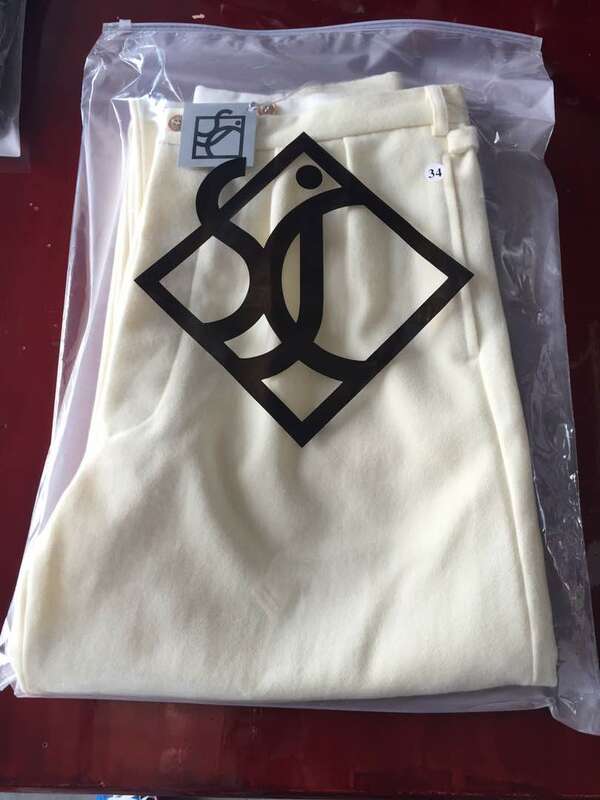 Loving the new shipping bags, very pro looking. Don't worry Ed you will be a lot slimmer in two months. Right so Flannels and chinos ship tomorrow, four-day turnaround, so what's that, Monday out for delivery. Dang it. I will just miss getting my chinos before I am going to Austria. Ah well, guess I have something to look forward to once I get home! I'm off to a wedding in the South of France in August, so hopefully will get soem great shots of my SJC stuff there! Received my gray flannels and three Oviatt polos...quite thrilled. The flannel is a lovely weight and the cut fit my big boy frame well. The workmanship appeared to me to be more than acceptable for an off the rack purchase. Now on to the 1930s suits!!! You know Ed i was just thinking (after ordering 300mt of flannel to be rewoven) "maybe I should put it into a jacket?" So are the flannels a success? Good question. Yes since I've only got 1/4 of the orders left. But not many orders since then. I wonder if its those waiting to see the likes of you in them or waiting for the weather to turn cold? Not sure. I think so. But I don't know. (07-24-2017, 07:07 PM)SJC Wrote: Good question. Yes since I've only got 1/4 of the orders left. But not many orders since then. I wonder if its those waiting to see the likes of you in them or waiting for the weather to turn cold? Not sure. I think so. But I don't know. Speaking for myself I was waiting to dial the fit of the trousers before ordering any flannel. Since I can only buy a few items at once it was obvious to pick the summer pieces and then go for the winter ones later.